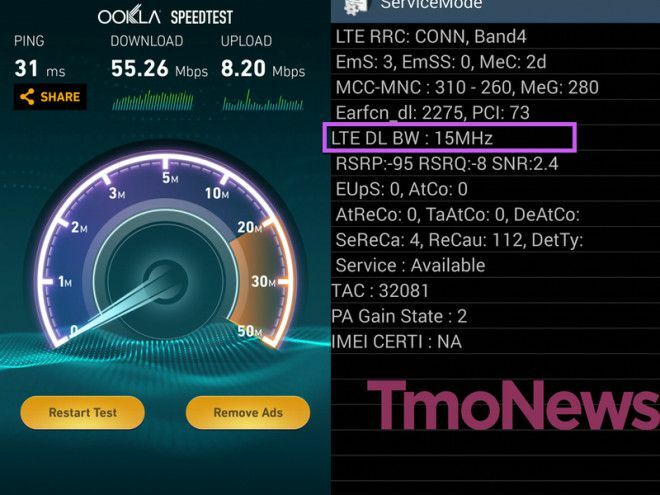 Late last year, we got news from our readers that 20+20 wideband LTE was starting to go live in Dallas, Texas. And not to be outdone by its neighbor, Houston is now showing signs of being upgraded to a faster network too. It’s the latest in a long line of upgrades we’ve heard about here at TmoNews, the most recent included higher download speeds in L.A. and Columbus, OH. Like last week’s speed tests, the performance has increased from around the 25Mbps mark, and has virtually doubled. Thankfully, this time our reader, based in Houston, Texas sent a shot showing his device’s ServiceMode screen, which confirms the network being used is 15+15 (notice the 15MHz highlighted in the image). T-Mobile has committed to reaching all the major metro areas with its super-fast LTE over the next year. For a few, that means 20+20, for many others it’s 15+15 and 10+10. Eventually, you’d hope (if spectrum allows) that 20+20 will be in all the major areas. Also this year we’re expecting old 2G networks to be replaced by LTE in a number of cities across the States. A movement which we believe is already underway. 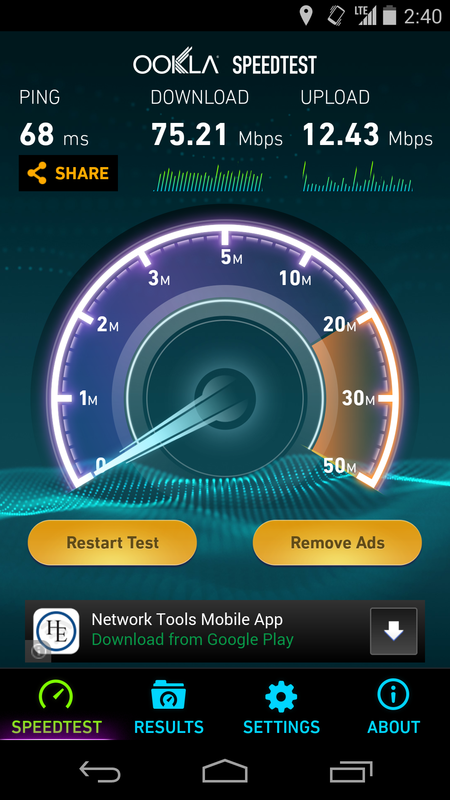 Our reader in Atco, New Jersey noted that speeds for him had also more than doubled in recent times. So, although the speeds don’t quite match the <70Mbps we’ve seen elsewhere, the improvement from around 15Mbps up to almost 40 is notable. Considering the volume of test results we’re being sent, it’s clear T-Mobile is doing some extensive network upgrading across the U.S. Although 20+20 is seemingly limited to a handful of cities right now, 15+15 is showing up in many areas. It’ll be interesting to see how these upgrades affect “official” network comparisons over the next 6-12 months. With T-Mo already being the fastest – according to SpeedTest results – how much faster than its competitors can it get? Thanks to everyone sending in LTE news. Keep ’em coming. I remember when I did that in my neighborhood. Helped me get into an exercise habit AND ended up helping them close a couple gaps! Any signs of the expected 2G replacement? Desperately needed around here but I haven’t seen it yet. I’ve seen one or two hints here and there. Nothing conclusive enough to post, yet. But something’s happening. Cedar City, Parowan, Nephi, and Tremonton, Utah all went from 2G to HSPA a few weeks ago. Burley, Idaho went from 2G to LTE a few weeks ago. Look at Sensorly. The Durango, Cortez, and Pagosa Springs, Colorado area has multiple sites going from 2G to HSPA and multiple brand new HSPA sites. Farmington/Bloomfield AZ is being upgraded too. 2G to HSPA sites plus a brand new site already broadcasting LTE. Ukia, Ca area is going from 2G to HSPA and LTE right now too. Does Sensorly show old data, so I can tell that it was 2G-only before and how long its been upgraded for? Or does it only have the new network information? Yes if you use go to Sensorly desktop website on your computer they have two different colors lime green for 3g and sky blue for edge. I do not think you can do a side by side comparison you would need to trust the locals for that information. People need to use the Sensory app more often especially if they have true unlimited data. If you use the app and check your travel you can easily see if any improvement. Even if not yet the information is vital for people who travel and need reliable information on coverage. There have been dozens of conversions already. HowardForum is the best source until this place gets its own forum. does anybody know the bandwidth for Florida? is it 15+15? How fast are u guys getting I’m just curious going to be in the Miami fl area in August. Are u guys getting 35-40 Mbps down and 20 Mbps upload? yeah around that range when you’re inside the t-mobile tower zone. They don’t limit roaming on Iowa wireless. When I was in Waterloo, I was watching Netflix a lot. Oh I know but try telling my wife that. I’ve been barking up that tree since the uncarrier stuff was announced with no luck. She seems to think we won’t get a signal anywhere outside of DSM. How do you get the service mode screen, in particular on a Nexus 5? Wondering the same thing, but on an HTC One m7? 25 miles outside downtown Houston and my speeds just jumped to 11mbps on 1 bar LTE and 38mbps on 3 bars. The only downside is that it is now so much better than my wired ISP service that I’m going to be severely pushed on the 3GB plan. It never mattered much before whether I used the wireless network or wifi, but that is clearly changing. I once got 74.94 down and 25.18 up in Santa Ana, Ca. Too bad I can’t put up a screenshot of it here. Post it, I’ll approve it. You have to upload it to photobucket or imgur or a site like that then post the link here. Once I see it come through I’ll approve it. Awww, thank you. :) David was here much longer than I, but I’m hanging in there! Me too. I’m holding on tho, I knew what I was getting into when I dumped AT&T. Sounds like it’s way faster than it was when I was there in February. :) I hit 50 once near Busch Gardens. Here In Lufkin, Tx I’m On 10+10 Mhz. This City Was A 2G Area Last Year. Last year in July 2013 I would get speeds up to 27mbps (outside) and inside my two story house downstairs, speeds up to 12mbps if I was lucky here in a neighborhood of Fontana, California. Now the most I have got inside on the second floor upstairs was 70mbps and downstairs now I get speeds up to 40mbps and yes I understand that it’s natural for all carriers to have a different in speed from one floor to another. Especially if you’re underground where there’s no service. So I’d thought I shared that with you guys. I’m guessing speeds will be increasing by a lot. I’ll keep you guys updated if I notice speed increases. Some parts of Milpitas I was getting 50mbps+. Right now I’m in Los Angeles but in a bad coverage area, 1-2mbps but at night I get around 3-7mbps. Wilshire and S Rampart, Los Angeles CA. But try around beryessa road, I used to get 30mbps on just H+ (3G). Wow nice dude. I’ll try San Francisco and Fremont again on speedtests. I havent been there in almost a year. But love how T-Mobile is rolling out 15+15 and 20+20 out in major cities. Im getting LTE in my apartment now back there at shark tank. I used to get only very slow 3G. So it looks like T-Mobile is fixing building penetrations. I did see a slight decrease in LTE speeds at Jackson & Mckee. When LTE first rolled out, I was getting 30+mbps but now I get under 20-10mbps but better than nothing I guess. I got 73 down 25 up and 33 ms ping after that happened. Limiting factor is now tower backhaul, not the radio technology. tmobile’s LTE blazing speeds were the reason why I had to upgrade my internet at home! Any idea on when Philadelphia, PA will get some 15+15 love or even 20+20? Waiting to see when this hits Orange County Ca. 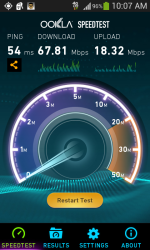 Thanks for the update… I’m seeing 15MHz in Central Florida and just ran a speedtest that hit 66Mb! Awesomesauce Tmo! Live in central Connecticut I belive. I’m consistently seeing mid 50’s. How do I check the MHz on a Nexus 5 to confirm? LOL, T-Mobile’s LTE in my area is crap, the fastest I’ve seen is 8Mbps down, seems they just changed what my status bar says and didn’t even really increase the speeds from hspa+, if anything, my speeds slowed after we received LTE, I used to get between 11 and 14Mbps down, now with FAUX LTE from T-Mobile, I get between 3Mbps to 8Mbps. Results vary, but there’s nothing faux about TM’s LTE. I get different download speeds as I move around my house. From almost 9 mbps in the area with the worst signal to 35 mbps on the 2nd floor, even though I only have 2-3 bars there. I’m 25 miles away from downtown. Nice download speeds, but what’s up with the slow upload speeds? I find it very, very strange that my little area of Panama City/Lynn Haven is on par with Houston. We must be sitting on tons of spectrum. I haven’t seen these speeds yet, I’m still hovering at 37, but when I check band info, it shows 15MHz downlink in Lynn Haven, and I assume in the surrounding cities!